NEWPORT NEWS, Va., Aug. 24, 2010 -- Northrop Grumman Corporation (NYSE:NOC) hosted a visit to the company's Newport News, Va. Facility by Susan Ford Bales, sponsor of the nuclear-powered aircraft carrier Gerald R. Ford (CVN 78). Bales had lunch with several shipbuilders and thanked them for their work on her father's namesake ship. "It's really nice to reach out and touch each of you," she said. "You are what makes the ship what it is, and our family really appreciates what you do." 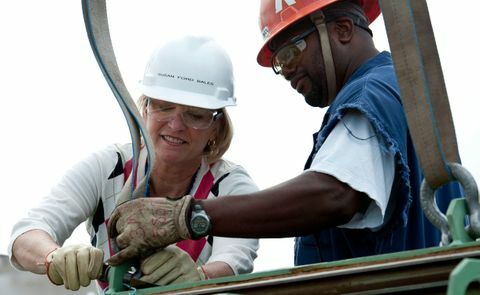 During her visit, Bales met with shipbuilders working on the ship and observed and participated in hands-on demonstrations including a module unit wire way review and inspection; weapons elevator door installation; a large module unit transit to the dry dock; and preparation of an air-conditioning unit. "It is always energizing to have the sponsor, and in this case the daughter of the ship's namesake, visit the ship and personally meet the dedicated shipbuilders who are building CVN 78," said Matt Mulherin, sector vice president and general manager of Northrop Grumman Shipbuilding Newport News. "These skilled men and women are committed to executing each phase of construction with their highest first-time quality and are honored and proud to show their work to our sponsor."